The Meccano-Erector – Super Construction Set, 25 Models, 640+ Parts is on sale for $50.00 at Amazon right now. That's 37% off the list price of $79.99! The Meccano-Erector 100th Anniversary Multimodel 25 Model Motorized Set unlocks endless construction possibilities with its 6V electrical motor as you build 1 of 25 motorized models! Build a motorized crane and bring it to life with the 6V electrical motor. Play with its rotary body and extendable hook! Made with 640+ real metal parts, the Multimodel kit utilizes 2 tools to build 25 unique quality models. Includes storage case. 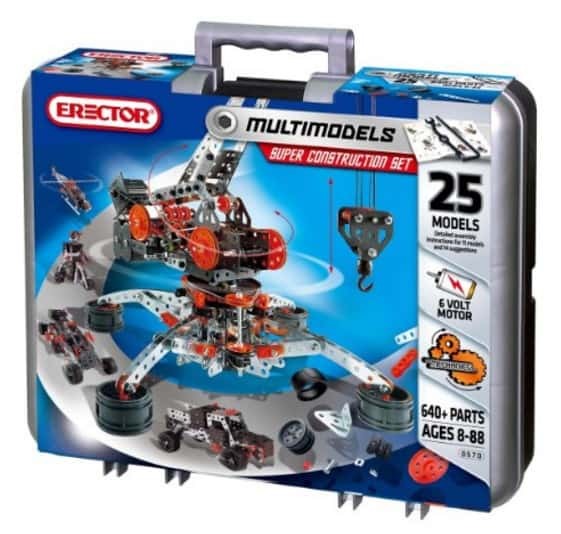 The Meccano-Erector Multimodel 25 Model Set is made for children ages 8+.